1994-1997 OBS CAN INSTALL USING THE SUPPLIED PARTS - simply remove your existing cooler, install the new cooler in the same location, and connect to existing lines. Millions of automatic transmissions fail every year from overheating. If you tow a boat, trailer, camper or drive in Stop & Go traffic you risk overheating your transmission fluid.When your transmission fluid reaches 200° it starts breaking down. Transmission coolers help extend the life of your transmission fluid and can prevent transmission failure from overheating. At 240° varnishes form and transmission life expectancy is cut in half. At 260° the transmissions internal seals and rubber parts harden and major damage starts. Above 295° your transmission starts slipping, clutches burn out and carbon forms. With each 20° drop in operating temperature, your fluid and equipment life doubles. Installing a cooler before damage starts and by reducing the transmission fluid temperature by as much as 60° can greatly extend the life of your transmission. Installing a transmission cooler can prevent transmission burnout. The 99-03 stock 7.3L cooler is a 28k GVW model. 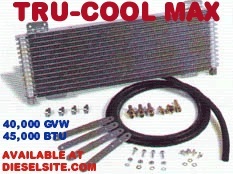 This Tru-Cool Max 4739 unit is a 40K model. This cooler is a "stand-alone" cooler designed to handle the heat load by itself, but in the 99-03 Ford trucks it can be used as an add-on cooler in addition to your OEM cooler. *In the 94-97 Ford trucks, remove your factory cooler. *Additional Hose and Mounting bolts may be needed for your application. 1999-2003 Ford F250 & F350 owners can purchase our Ford Superduty specific installation kit with special instructions, extra bolts and extra hose specific to your vehicle. Q: "I plan on a 27-30 TT next spring and with moving it in and out of camp grounds and my storage area on the military base, I'm worried the tru-cool won't keep the temp down." Q: What makes the Tru-Cool different or better than anything else? A: To answer this, you have to understand what different cooler designs there are in use. The most common type is the "tube and fin". This style has small tubes that the fluid passes through and the tubes are surrounded by thin aluminum fins that cause passing air to turbulate or tumble over the tubes to pull heat away from them. The next kind and far more efficient is the "stacked plate". This type uses flat hollow plates for the fluid to pass through. This increases surface air and the thinner area of oil increases the amount of heat transfer. The third kind- that of the Tru-Cool Max - Is the "fin and plate". As the name implies, it uses the plates in the stacked plate design and the air fins of the tube and fin design and combines them for the most efficient type of air to liquid cooling transfer possible. Q: I have added an additional cooler to my Powerstroke truck and I still see higher than expected temps. How do I check to see what is wrong? A:IMPORTANT! The temps should be measured in the pressure port in the driver side of the transmission body. If you are measuring temps from a tee in the output line, temps will read about 30 degrees hotter than temps read from the pressure port. Bring the transmission up to temperature. It needs to be at least 100 degrees for this test. Remove the rear line from the transmission and place it into a bucket or similar container so that you can measure volume of your flow. Have someone turn the truck on. At idle (in park), you should measure 32 ounces of fluid in your bucket - in 15 seconds or less. This is an absolute minimum number. A properly working transmission will flow that amount in about 10 seconds or less. You should not see ANY fluid pumping out of the rear transmission port. If you have the proper amount of flow, your transmission pump and coolers are working fine. SO, if you are running hot and have the proper flow (with no fluid coming out of the rear transmission port), you most likely have a mechanical problem causing high heat. This could be torque converter slippage or one of many other internal problems. You may have to see a professional at this point to help diagnose the problem. If you do not have proper flow, OR you have fluid coming out of the transmission rear port, you either have a cooler blockage, OR a faulty cooler bypass valve. Here's how to tell. Trace the forward transmission line to the front of the truck. Remove the line from the 1st place it enters a cooler or the radiator (if so equipped). Now, do the same flow test checking flow at this point. The first is that you now have enough fluid flow- this means your cooler /coolers are partially blocked. To determine which cooler is plugged you would perform the same flow test through one cooler at a time. The second outcome will be that you don't have enough flow even with all coolers disconnected. This means you have an internal pump problem. IMPORTANT! The outcome of this test assumes that you have NO fluid exiting the rear port of the transmission. If you perform a flow test with the coolers disconnected and you get fluid from the rear port on the transmission, your cooler bypass valve is bad. I purchased a Tru-Cool Trans cooler a couple of weeks ago. Went on easily. It's nice to finally have something advertised and work as well as such. The trans temp with a large, approx. 14800# of tractors and trailer + truck, load, the temp was 40 degrees cooler than normal.